Child and Adult Orthodontics; Drs. Carlough, Burzin, and Gagnon Be sure to like them on Facebook! Gather your friends and co-workers for this fun filled event. Pre-Registration is strongly encouraged, but day of entries will be accepted until 2:00pm. 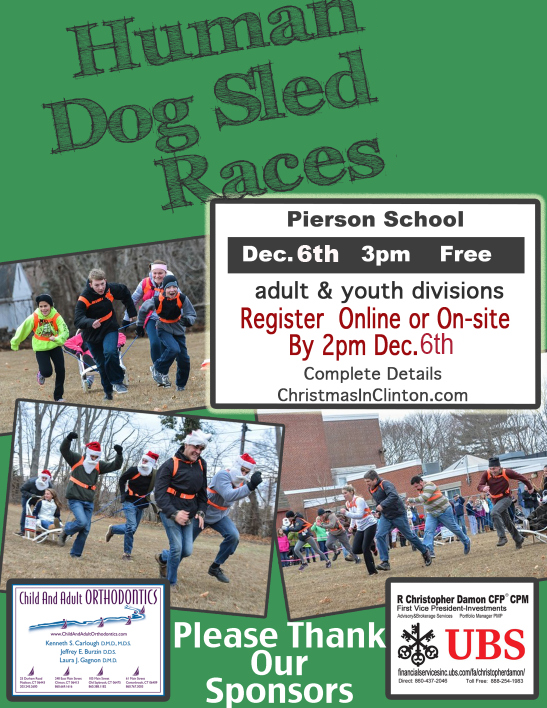 Participants must show up no later than 2:30pm at Pierson School’s Back Field. The entire team must start behind the starting line. Once the sled has crossed the start, the “musher’s” feet must remain on the sled in order not to aid the sled across the finish line. The “rider” must remain on the sled for the entire race. The entire team must stay within the race lanes. Any team, or part thereof, that goes out of bounds may be disqualified. Each team must have all of its members with the sled when it passes the finish line. The team whose entire sled passes the finish line first is the winner for that heat. Competition will be single elimination (depending on the number of entries, we may do double elimination). Winners continue to compete until they lose. The sled will be provided and may not be altered in any way. Harnesses will be provided and rigged to the sled. Footwear: Rubber cleated shoes may be used. No metal cleats or spikes. Any infraction of the rules regarding the race, team or equipment guidelines may result in team disqualification.